BUNIĆ, Sanja (2017) Story Behind the Guidelines: Developing the Guidelines for Library Services to People Experiencing Homelessness. Paper presented at: IFLA WLIC 2017 – Wrocław, Poland – Libraries. Solidarity. Society. in Session 112 - Poster Sessions. The interesting and challenging process of developing IFLA guidelines is hidden from the eyes of most readers. 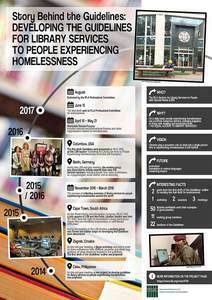 The aim of this poster is to illustrate the process of the development of guidelines, using the example of the Guidelines for Library Services to People Experiencing Homelessness. Over the years, the Section for Library Services to People with Special Needs (LSN) has taken different steps in the development of these guidelines. Homelessness is an extreme form of poverty and a fact of life in all countries of the world, regardless of the level of development of their economic or governance systems. 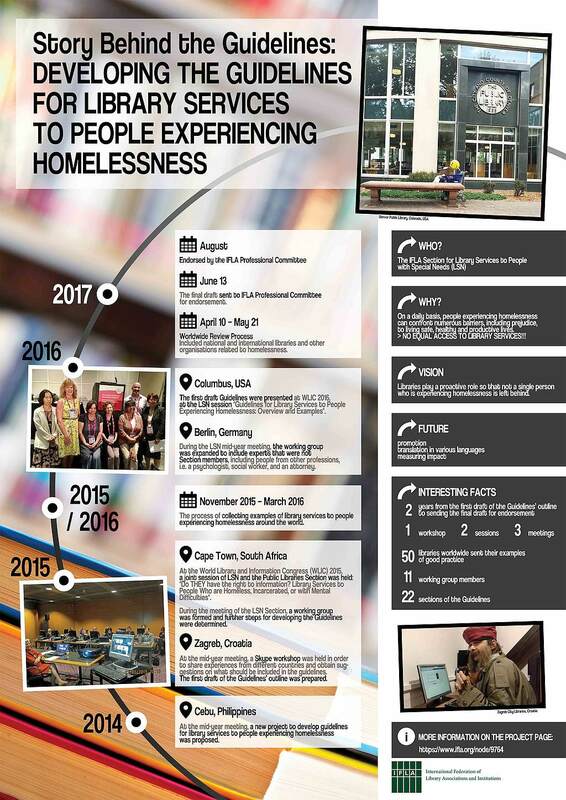 Libraries are an important part of the organizational network that can empower people experiencing homelessness and provide them equal access to information, skills, and knowledge. In the development of these Guidelines, there were contributions from experts that were not Section members, including people from other professions, i.e. a psychologist, social workers, an attorney, as well as a person experiencing homelessness. Examples of good practices from more than fifty libraries worldwide were collected. The most important information and steps of the development of the Guidelines will be presented using a timeline, photographs and information graphics.